Home / Blog / Spring Into Summer . . . How Do I Do That? It’s that time of year where the days are getting longer, warmer, and time is spent outside. We love this time of year! We wait all winter long for this time of year. So how do we make sure to take care of our skin as we start to expose it more? Below we’ve made a “fool proof” list of products and treatments that will continue to help take care of your skin so you have one less thing to worry about. 1. Hydrating Treatments: your skin is going to get increasingly dehydrated as it’s exposed to the sun more and more this summer. Be sure to stop in for a few facials this time of year; especially our Ultrasonic Hydration Facial. 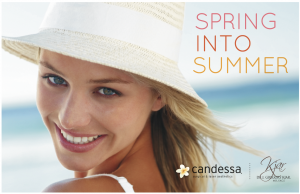 Don’t forget to include and much needed drink for your skin with our Candessa Sheer Peptide. Your skin will REALLY thank you. 2. Anti-Oxidant Protection: Our skin needs a small dose of the sun’s rays, but after that the ultraviolet radiation can wreak havoc in our skin. That is where Antioxidant protection comes in to the rescue by balancing/neutralizing free radicals that are caused by exposure to the sun. Our Anti-Ox Ultra is a light, fragrance free serum that will keep your skin safe throughout the summer. 3. Broad Spectrum Sunscreen: It’s obvious by the above paragraph that we need more than an antioxidant to keep our skin safe. We need a high quality broad spectrum sunscreen. What does “broad spectrum” mean? It means that it has a Zinc Oxide of atleast 2% to help reflect those UVA, UVB, and a portion of the UVC rays that come from the sun. Our Candessa SunStop and SunStop Clear protect your skin all while moisturizing it for your specific skin type. Who wouldn’t want a multi-functional product like that? There you have it. Your summer skin care is simplified and you can feel confident that your skin is taken care of! Contact us or order online . . . we’d love to hear from you!